In 1915, Alfred Wegener proposed that all of Earth's continents were once joined in an ancient supercontinent he called Pangaea. Wegener's idea of moving continents led to the modern theory of plate tectonics. Create your own version of Pangaea by fitting Earth's landmasses together like puzzle pieces. Use evidence from fossils, rocks, and glaciers to refine your map. Learn the names of major landmasses. Explain the theory of continental drift. 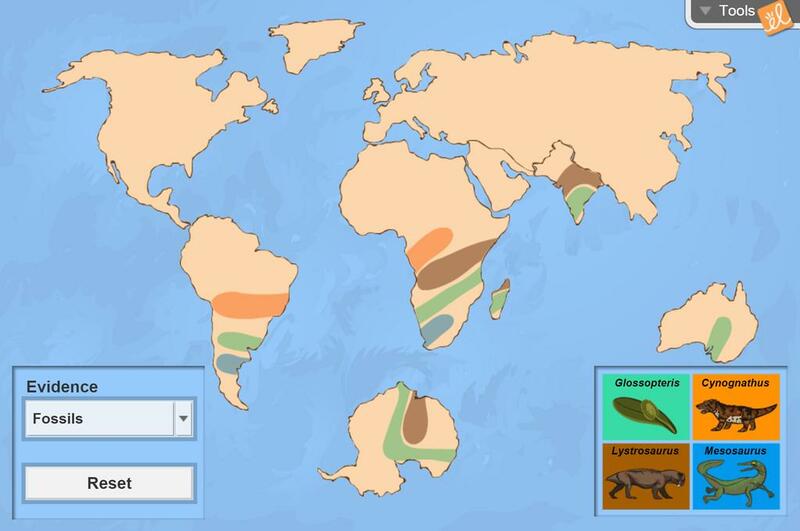 Fit the landmasses together to form an ancient supercontinent called Pangaea. Use several types of evidence (fossils, rocks, glaciers) to revise their model of Pangaea. Lesson Submission CER prompt This document is intended to support students in constructing explanations... (more) in science utilizing the claim, evidence, reasoning framework for talk and writing. After my class completed the Building Pangaea Gizmo, they completed these guided notes and glued them int... (more)o their interactive science notebook. Excellent reinforcement to use with 6th graders to explain support for Continental Drift Theory. Helps ESL students in particular to understand topic. Students will be quite excited about this Gizmo that lets link evidence showing millions of years of plate movements.